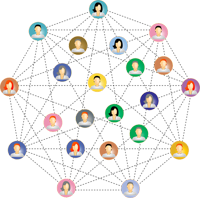 Choose a networking group or groups where you like the people. You are going to see the same people week after week or month after month, so the more you like them the better your experience will be. Get to know and like the members of your group(s). To get to like and know people, spend time outside of the usual meetings with them. This can be one on one or in a group setting like a painting night or Holiday dinner. Challenge yourself to give as many leads as possible and to be a source of help to other members. This challenge can help to keep the feeling of the daily grind away. Consider other successes other than monetary. Did another member get you in touch with a lender that help you save lots of money? Did using the mortgage broker help you save on your mortgage or at least help you get that mortgage in the first place? These numbers don’t show up in the earnings column, but these do in savings and possibly peace of mind. Be successful. Track your income generation from your networking. Add to where you are succeeding, modify where you are not and if that doesn’t work, don’t be afraid to walk away. Try a variety of networking opportunities from small exclusive groups to chamber of commerce events to “night out” events, such as a bowling night. Get involved in a group activity, whether that’s a regular exercise group, Toastmasters, or whatever you like. It’s important to choose something you like so that people will see you at your best.